The Johnson Family: Happy 6 years! I wish I'd have taken more pictures, but alas, I didn't. It was my year to plan, so I was a bit preoccupied. We've been following the traditional list for anniversary gifts (found HERE). This year was candy/iron. I'm not sure why it has two, but I thought I'd go with both. 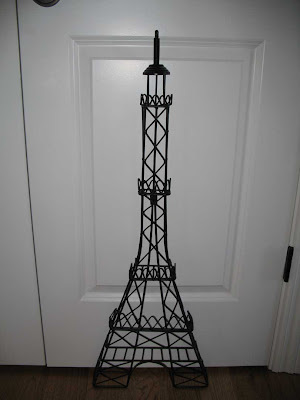 I got this cute wrought iron Eiffel Tower to match with a painting we brought back from Paris. 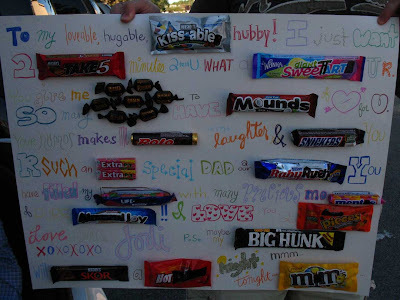 Then I made him a candy bar card. Disclaimer: If you read the card, please note that ALL candy bar cards are incredibly cheesy. Thanks Neil for an amazing 6 years and for many more to come! You fill my life with such joy and I love you so much!!! P.S. 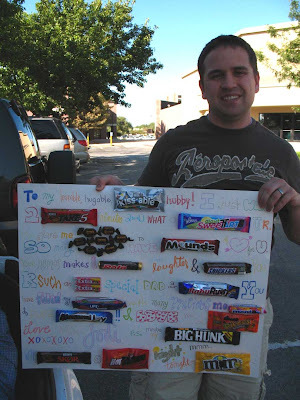 He went with the chocolate theme and got me a DIVINE box of See's chocolates, which he handpicked all of my favorites! Can I just say HEAVEN?! CUTE! HAPPY ANNIVERSARY! LOVE YOU GUYS!